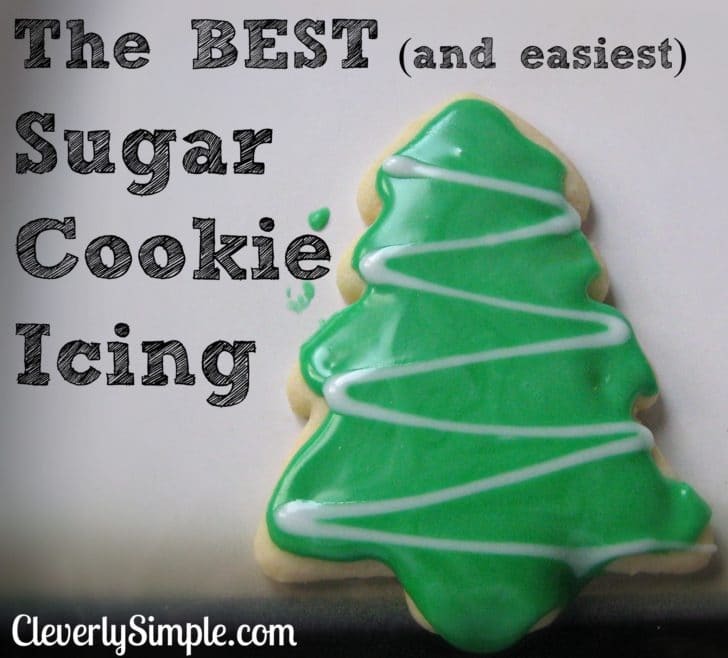 Do you want an easy icing for sugar cookies that leaves everybody wanting more? 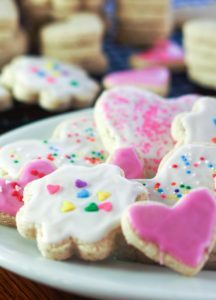 Yesterday I shared a wonderful Easy Sugar Cookies recipe. 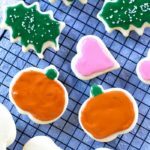 Today I want to share how to make a quick and easy glaze/icing that goes perfect with the sugar cookie recipe. And the best part — it’s two ingredients! You know I like to keep it Cleverly Simple! 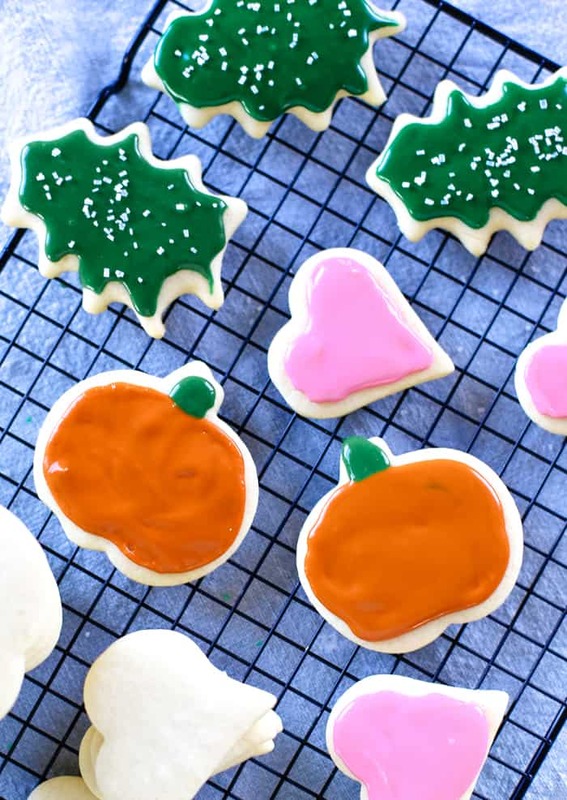 Want more sugar cookie inspiration? 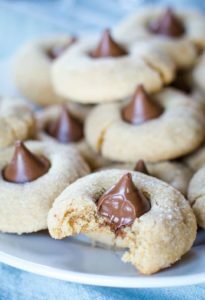 To find the Best Sugar Cookie Recipe, head over here. 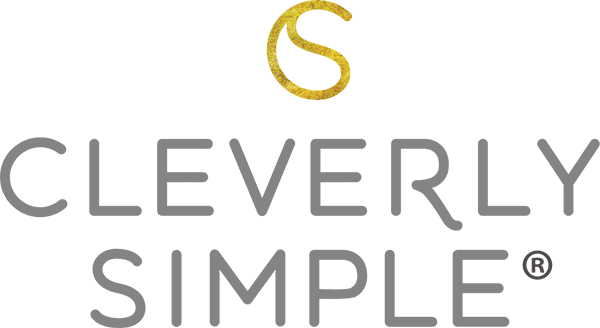 To find the Best way to Simplify the Sugar Cookie Recipe process, head over here. 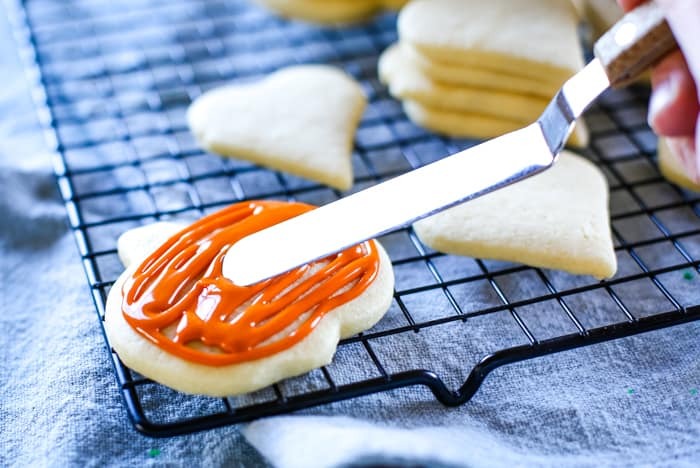 This is easiest sugar cookie icing ever. It’s made with only two ingredients! 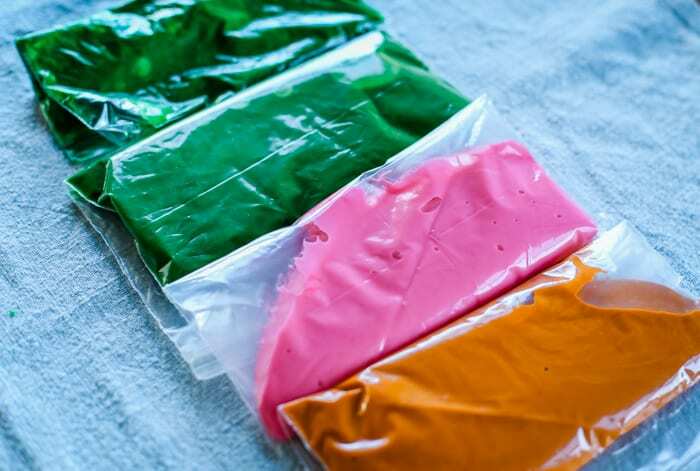 Add food coloring to icing (optional) to create unique colors. 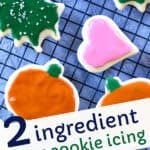 Add icing to your favorite cookie recipe. You can customize this recipe by adding powdered sugar to make it thicker. Add more milk to make it a glaze. You start with the simple ingredients of powdered sugar and milk. And of course, make sure you have your sugar cookies baked and cooled. 1. 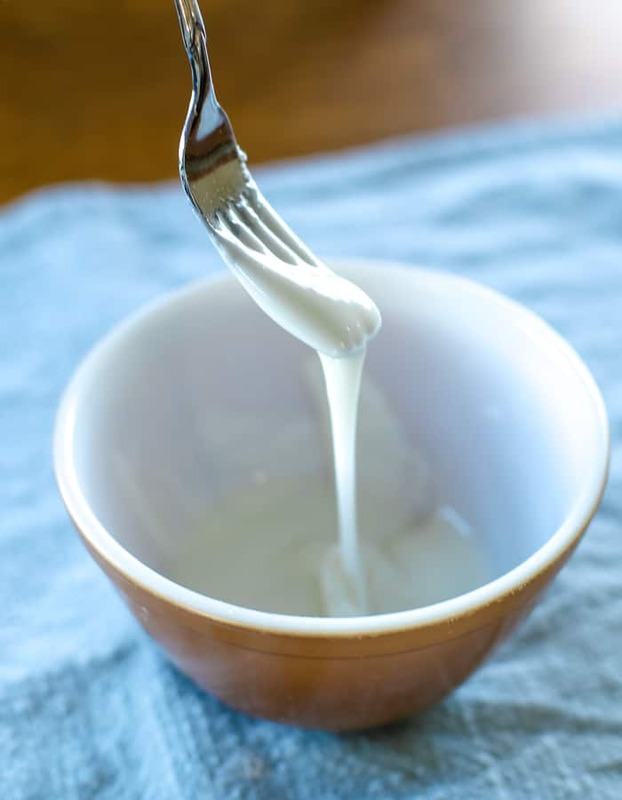 Mix the powdered sugar and milk with a fork until smooth. The powdered sugar will dissolve. There’s no need to dirty more dishes than that! I like the consistency of this recipe but you can make it thinner or thicker by adding more milk or more powdered sugar. 2. Add the icing to a ziploc sandwich bag. (If you’re fancy, you can use an icing bag.) Add food coloring to color. (Optional) Mix. *This is a great step for kids! 3. Cut a small hole in the corner of the bag. 4. Pipe the icing onto the cookie and use a knife to spread the icing. If you like to add a bit of color, just follow the first steps and use a different color of icing. The glaze does start to dry immediately. Therefore, add sprinkles right away. Let the cookies sit until the icing/glaze has time to harden. You can then stack the cookies. They freeze really well this way so you can bake weeks ahead of Christmas! 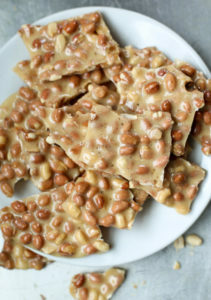 Can you substitute buttermilk or non fat milk for this recipe? Non fat milk would work as a substitution. With less fat content it may alter the richness but I think overall it will be fine. Buttermilk can have a sour taste so I wouldn’t recommend using it. I’ve always used water and love the glaze! My problem is decorating over the glaze. The darker decorating colors fade into the background color. 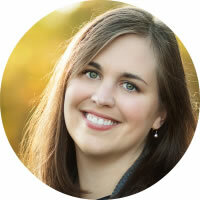 Would using milk eliminatethis problem, or do you have any other suggestions? Thank you! Hi. 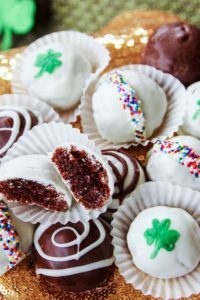 If you’re wanting to do a color on top of another color, you will need to let the first layer completely dry and then add the next layer of icing. I was wondering if how to store the icing when done with it. want to use it again and have plenty left over for more cookies later. does it go in frig. will be trying today with my granddaughter.. Thanks for all your help.. I typically don’t save it. But you could store it in an airtight container in the refrigerator? I’m not sure if it will start to harden on it’s own? Let me know how it goes. Yes, this icing will harden. If you put it on thick it will take longer to harden and may have a bit of a softer under-shell, but overall, it’s an icing that hardens so that you can stack the cookies.